The rsearch article 'Can the variance in membrane performance influence the design of organic solvent nanofiltration processes?' 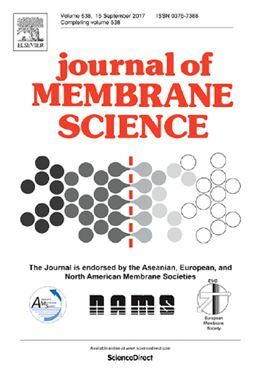 has been published in Elsevier's Journal of Membrane Science ( Volume 575, 1 April 2019, Pages 217-228). The development of organic solvent nanofiltration (OSN) membranes has been a continuous effort during the past decade. Several groups generated and published experimental results and simulations with either tailor-made membranes or industrial products. The published data space is diverse, with a single publication often focusing on a certain membrane only, a group of specific solutes only, on the effect of solvent only. A comprehensive comparison of all of these is still lacking. An analysis on the reliability of quantified transport parameters is missing, in particular when different analysis methods and different membrane systems are used. The technology is in its incubation phase with a need for reliable data and measurement standards to ground the process design on reliable membrane transport properties. This study uses an unprecedented extensive standard experimental procedure to measure separation characteristics of polymer membranes for the separation of organic solutes from organic solvents. For a variety of different solvents, solutes and membranes, flux and retention measurements are rigorously characterized by round robin tests at different labs using different analytical systems. This extensive collaborative study evaluates for the first time which fluctuations in results occur under comparable conditions of lab-scale experiments at different locations and which influence these have on the design of OSN processes. Utilizing the variance in the membrane transport data, a process design study and optimization is presented. For the first time ever, we report how variance in membrane transport properties can influence the process design ranging from a simple single stage system for values for the upper transport limits, to a two stage system with a permeate recirculation for mean values, to a complex three stage system for the lower limits.